I am in a swap on Two Peas in a Bucket that is a scrapbooker's cupcake theme. Above are my ACT (Artist Trading Cards size 3.5"x 2.5") for one of the groups. 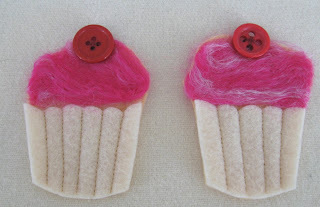 These are my felt cupcakes. 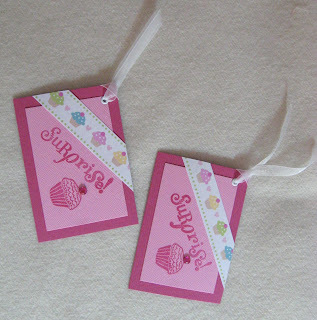 They can be used to embellish a scrapbook page. I have sewn the paper cup part and then needle punched the pink wool to make the frosting, added a cherry on top with a button. They almost look good enough to eat. These are my pages for the 6" x 6" page swap group. I have Shrink Dink buttons on the left page and a tag in a pocket. Then the right side has is a band on the bottom using the Burnished Velvet technique. It is the first time I had tried this. It is double sided tape on a printed paper and then a transparent super fine glitter. You rub the glitter into the tape and it gets a smooth feeling and lots of glitter. A couple of Canadian girls are the creators - Deanna Pannell and Haroldine Wingfield. The photo does not show the glitter. The large cupcake is a stamp I made. I made a stamp using Speed ball matterial. 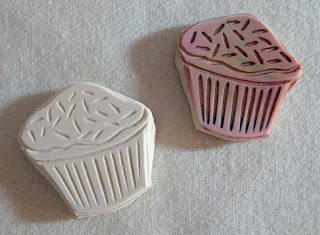 I drew a cupcake in pencil, on paper then rubbed the pattern onto the rubber. Then crave away some areas and not others. The stamp on the right is my used one and the stamp on the left is to swap. I think all the groups I am in have 10 people. So I have made 10 of each and will get back one of mine plus 9 other cupcake things. wow. now i'm jealous... hehe on another note... i used that stamp you used in your atc's on gift tags. i don't like the size of the cherry that came with it though... *sigh* By the way, your handmade stamp is amazing! Everyone is going to love your projects! So cute!